It is a pleasure to be with you at the inauguration of the 3rd annual investor conclave organized by the Ceylon Chamber of Commerce. This event has now become a firm fixture in the country’s investment promotion calendar, bringing together over 100 foreign investors from over 20 countries. 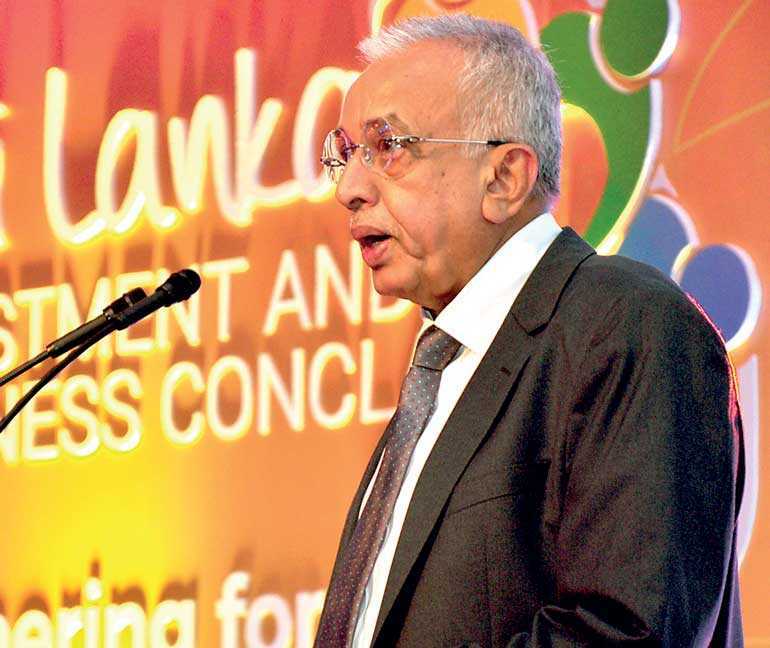 What is also unique about this event is the collaboration between the Government and the private sector, where the Board of Investment in Sri Lanka and the Sri Lankan diplomatic missions overseas were key partners of the Ceylon Chamber to make this event a success. Friends from overseas – you are visiting our country at an eventful time in our economic trajectory. Our Government has taken numerous initiatives to stabilise and re-orient the economy, from a growth model that was inward-looking and heavily dependent on debt-fuelled public spending, to one driven more by the private sector, trade, and FDI. We have taken many measures to build strength and resilience, focussing on both fiscal consolidation and prudent monetary policy. On the fiscal side, we have introduced a new income tax law and introducing greater budget discipline. In fact, last year we achieved a primary budget surplus for the first time in six decades. We are very conscious of the high debt burden and have introduced new measures to build up our strength – like the ‘Liability Management Act’ that was passed in Parliament last month. We are confident of meeting our foreign liabilities, and global investors remain positive about us. The recent sovereign dollar bond of $ 2.5 billion was nearly three times over-subscribed. Having stabilised the economy over the last three years, attracting foreign investment is a key priority of the country right now. During this conclave, you will no doubt realise that Sri Lanka is an excellent springboard for your operations in this region. We know of many new investors who are locating in Sri Lanka as a regional Hub, to reach Africa, Europe, and of course South Asia. Sri Lanka is uniquely placed on the Western edge of Asia, as well as in the centre of the Indian Ocean. This geography offers very unique opportunities to investors from around the world. Of course, we are conscious that location alone is not enough. Our Government is very focussed on improving the investor climate and easing the burden for investors who are interested in locating here. Earlier this month, the Board of Investment launched an online portal for investor applications and facilitation called ‘SWIFT’. This will make your entry more streamlined and will ensure greater transparency. We also have several high-level mechanisms to fast-track decision-making and resolve investor issues. There are also 10 taskforces tackling 10 vital aspects of the ‘Doing Business Index’. Under these ongoing reforms, the e-Registrar of Companies – ‘eROC’ - was launched and has cut the time taken to register a new business from six days to just one. By later this year, finding land and registering property will be halved from 51 days to 26 days, and the procedures reduced from nine steps to two steps. Meanwhile, to address the issue of land availability for new investors and being mindful of water and waste concerns, we are preparing new industrial zones for foreign investors to locate. Sri Lanka hasn’t had a new zone in over 15 years, and the new zones will be open for private investors to develop, in partnership with the BOI. These initiatives are being complemented by comprehensive trade policy reforms, articulated in the New Trade Policy of our Government. In the recent Budget, protectionist para-tariffs on over 1,200 items were removed, with the rest slated for removal this year and next year. To leverage on our location and to expand market access, we are expanding our trade and investment links with a diverse set of countries – US, EU, India, China, Singapore, Japan – and we also are signing a number of trade agreements. In January, we signed a landmark Free Trade Agreement with Singapore. To have done our first comprehensive agreement with a country like Singapore – regarded as being one of the most open and liberalised economies and having high-quality institutions – is an especially important milestone for our country. The negotiations on the comprehensive Economic & Technology Corporation Agreement with India is progressing well and we hope to conclude same by the end of this year. The discussions with China on a FTA are ongoing and we intend commencing negotiations with Thailand next month. Now to an area which I’m sure all of you are interested in – the incentives regime. As you may know, we introduced a new Inland Revenue Act which came into effect from April this year. Our previous Act had become unwieldy, with numerous changes and additions made over the years. The new Act, which was developed with technical advice from the IMF, is a modern, transparent and streamlined Act that is based on international income tax principles. The top rate of corporate income tax is now lower than Bangladesh, India, Brazil, Mexico, and on par with South Africa. The top rate of personal income tax is now lower than all of these countries plus Thailand, Vietnam, and Turkey. There is a popular misconception that the new Act has removed tax incentives. This is incorrect. Under the Act, an investor would receive capital allowances and accelerated depreciation based on the size of the investment, and you can set off your investment against future taxation. In effect, you don’t have to start paying income tax until you recover your investment. For every capital investment, there is an additional 100% capital allowance and for investments above $ 100 million the capital allowance goes up to 150%. Many of you may be more familiar with outright tax holidays. Our new incentives regime may not be blanket tax holidays, but it is effectively the same when it comes to your tax burden. For example, if you invest 10 million dollars in a venture here, in capital equipment etc. (apart from a land purchase), until you recover your 10 million dollars, you won’t have to pay tax. It’s that simple. And even after that, if you are in an export-oriented industry you will only pay corporate income tax at the low rate of 14%. This targeted tax relief is attractive for genuine investors who believe in investing in the future of Sri Lanka. We are also looking at further reducing the upfront costs of investment by cutting the various border taxes that you face. We are also looking at making the taxable period start only after commercial operations have commenced. We are proud of the investment frameworks we have in our country and I assure you that you will be treated fairly and with respect. We are further strengthening the sanctity of agreement between the Board of Investment and the investor, and we already have bilateral double tax avoidance agreements with all of your countries. Most importantly, our country protects your investment under the supreme document of our land, the Constitution. In concluding, I want to welcome you all to experience the opportunities Sri Lanka has to offer and partner with the very competitive local firms you will meet at this Conclave. We see FDI attraction as a way to add to our existing capabilities, as a way to bring in know-how, new technology, and access new markets. We are focussing on opening up our economy, learning from the lessons of Singapore, Vietnam, Thailand, Malaysia and others in the region. We invite you to take advantage of the new growth story playing out here in Sri Lanka. Locate here to gain from our efficient port infrastructure, our preferential access to large markets in the region, and a human resource pool that has high human development indicators and are highly trainable. Locate here to enjoy the benefit of being in a clean and liveable city, with easy reach to India, South Asia, East Asia, Africa and the Middle East. Invest here to partner with Sri Lankan companies that are becoming renowned for their sustainability ethos and world-class management. We will support you with all the facilitation you need. I wish you a productive conclave and successful matchmaking sessions!